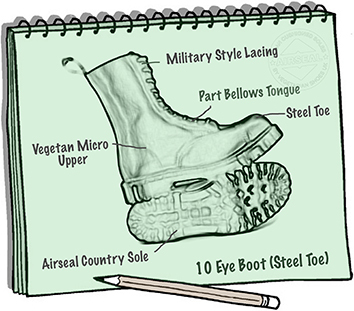 Our regular 10 eye boots have a distinctive grain pattern on the micro-fibre uppers. These have a more classic smooth finish and can be polished to a shine or left dull. The high quality Vegetan Micro uppers (Japanese micro-fibre finished in the UK) wear and age exceptionally well, and they look and feel like supple leather. Breathable and water resistant.